Trend Alert! Did you know denim is an up and coming trend in the craft industry? Fabric designers have new lines coming out with a denim look, I’ve seen it in magazines, in embroidery hoops, and more! 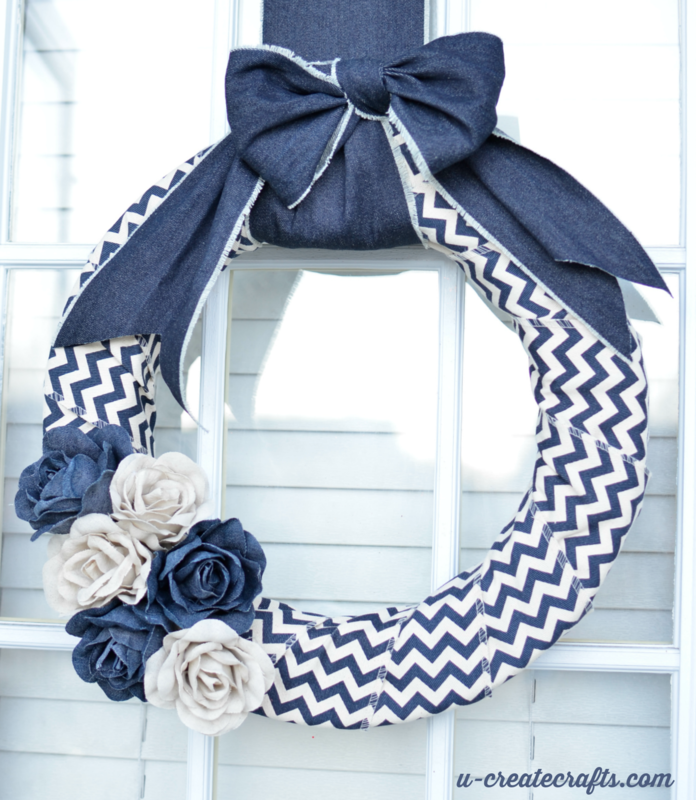 This month’s Michaels Makers challenge is all about denim and I’m showing you how to make a chevron, denim wreath. 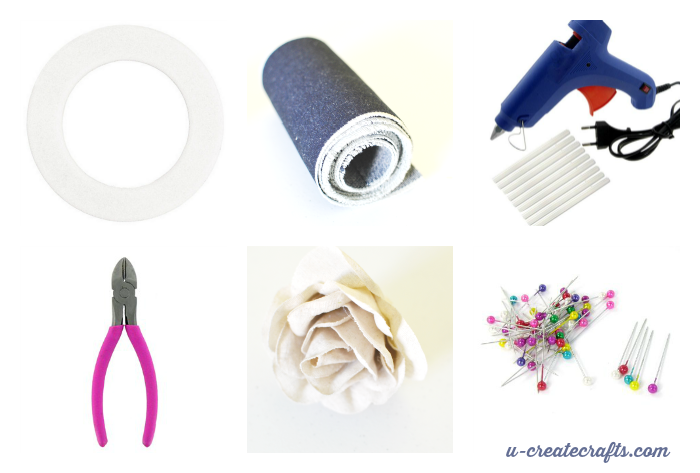 Wrap ribbon tightly around foam wreath and secure where you start and end with a couple of sewing pins. Cut off the stems on the flowers using wire cutters. Glue on the flowers using your glue gun. Tie with ribbon and display! Change it up with any ribbon and your favorite flowers for a customized look for your decor! Love this! So fun and spring-y! Thanks so much! It was so simple to make! Great Idea! Spring is in the air! Awesome!! What a different way of looking at denim for sure. Great job! This looks like a great idea to make with a pair of jeans that are worn and old. Maybe by cutting the jean legs on bias to wrap around the wreath? Seems like a great way to recycle/re-purpose denim clothes. I just wrapped a big loop around the top and tied a bow and used a hot glue gun. Hope that helps! this is such a beautiful wreath. what size is the Chevron ribbon? it looks 2 inches wide. 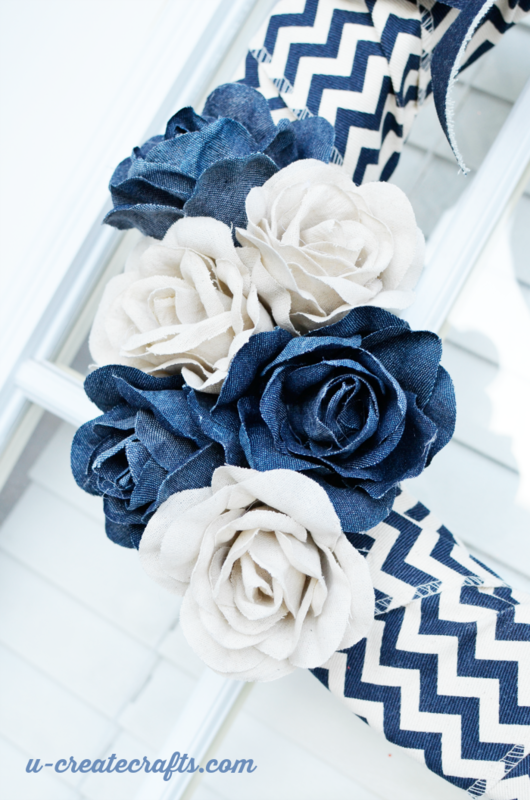 Yes the ribbon is 2″ wide and all the roses are denim. Thanks for your comment!